Save the date to celebrate the Hideaway Cafe's 10 year anniversary! Saturday, April 13th starting at 2pm. Join us for a fun day of live music, craft beer, local vendors, and more. The side street will be closed and packed with a stage, an outdoor bar, and local vendors selling vinyl & vintage goods! 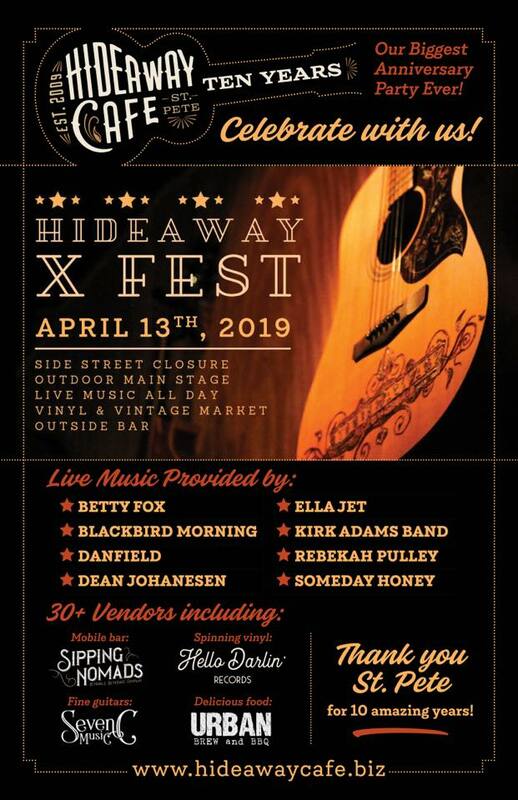 The very artists that helped make the Hideaway what it is today will share the stage and help us celebrate this momentous occasion! Stay tuned for the line up! Vinyl & Vintage will be here - A curated music market with local vendors selling vinyl, vintage goods and clothing, music memorabilia, instruments and handmade goods.